Designed to offer a luxury camping experience for couples, families and lone travellers, the Roma Capitol Camping Village is a recently built site with brand new facilities. There is a large modern pool complex and a multisport area, but you can also visit the nearby beach, or take a day excursion to Rome. 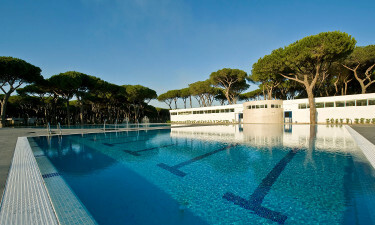 To reserve a break at the LuxCamp Camping Roma Capital, just get in touch. Offering sumptuous mobile home accommodation and a pinewood backdrop, this camping site is located inside the beautiful Pineta di Castel Fusano urban park. 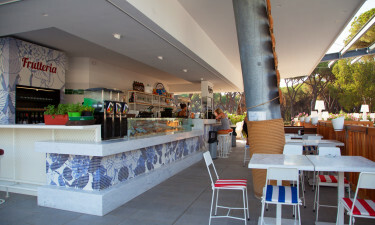 The poolside restaurant serves up a range of tasty treats and cocktails on the terrace can be enjoyed each evening. Why choose Camping Roma Capitol? 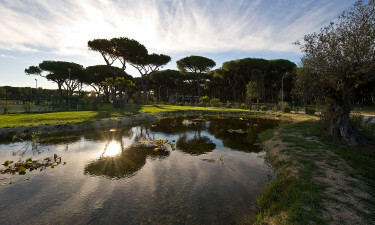 Camping Roma Capitol is ideal for visiting all the attractions of Rome whilst staying in rural surroundings. A cool dip in the resort’s immaculate free-form pool will make this luxury camping site one to remember. However, after a busy day of sightseeing, you can also unwind in the wellness area for a rejuvenating hydro-massage. If you love a sporty camping holiday, you can keep fit on Roma Capitol’s courts and fields. So whether your passion is for tennis, football or basketball, you can organise a team and play a few games with family or new friends.